Natalia Zukerman will be presenting The Women Who Rode Away: Songs and Portraits. This is Natalia's new multi-media performance featuring a body of work in which her songs and paintings engage in a dialogue. Edifying and entertaining, Natalia tells the story of women who were and are architects of their own life; who defy categorization and simultaneously illuminate what it means to be truly self-actualized. One of her subjects is Edna St. Vincent Millay. Here is an excerpt of Natalia's comments about her. "...Vincent died by falling down the stairs where you’re standing, though they don’t tell you that until the end of the tour in what they tell you is “a great mystery” as to how she died. She was a morphine addict. She was found 8 hours after her death at the bottom of those stairs. At the top was a wineglass and an empty bottle. Is it possible to live a life so complete, defying categorization, inventing each day and feel so much that you feel nothing at the very same moment? If you trap your words inside a display case like tiny seashells, if you close a heavy wooden door on the room of your own and sit by a wood stove with only language and memory to hold, with the ability to distill to essence every experience, to understand each departure before you’ve even arrived, you may very well disassociate from every heavy pillowed fainting couch, every lacy curtained garden view that you’ve curated and weeded yourself." 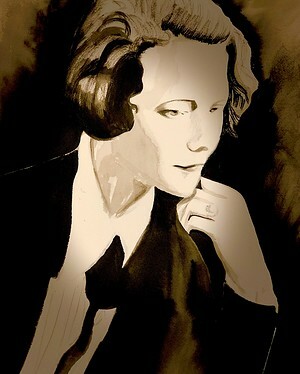 You can here a sample of the associated music Natalia will be playing in the Related Link at the foot of this article - and the image with this article is one of Natalia drawings of Edna St. Vincent Millay.